Begin by putting your bead on your hook then putting it in the vice. Tie on your thread beginning behind the bead and trim off any excess. Wrap the thread towards the rear of the hook. After stacking a small bit of moose hair tie in the hair where you stopped the thread. Trim off any excess after the moose hair is tied in. At the point of where you trimmed off the excess moose hair tie in the d-rib, taking several wraps with your thread towards the rear of the hook. Take the d-rib and begin wrapping it towards the bead of the hook, take several wraps stopping halfway up the fly to form the abdomen of the fly. Tie off and trim off any excess. Tie in the sili skin. Take a medium amount of peacock dubbing and form a dubbing noodle on your thread. Wrap this dubbing noodle to behind the bead to form the flies thorax. Cut the tip off the partridge feather to form a small v with the partridge tips. Tie a hook gap of these tips to the fly behind the bead, trim off the excess. Bring the sili skin up and over your thorax to form the wing case and tie off just behind the bead. Whip finish and trim off excess thread. Take a small amount of uv resin and apply it to the wing case then zap with uv light. Bring your thread back to the point where you tied in the d-rib and tie in the sili skin. After the sili skin is tied in take the d-rib and begin wrapping it towards the bead of the hook, take several wraps past the sili skin. Tie off and trim off any excess. Take a medium amount of rabbit fur and form a dubbing noodle on your thread. Wrap this dubbing noodle to behind the bead to form the flies thorax. Behind the bead tie in a single strand of krystal flash that has been doubled over. Trim off the excess but do not worry about getting it the exact length you want for your legs. (Optional) Take a small amount of uv resin and apply it to the wing case then zap with uv light. Start by putting the bead on your hook and putting in the vice. Wrap the thread behind the bead and secure to the hook, cut off any excess. Tie the d-rib behind the bead. Wrap thread down with the d-rib down to the bend of the hook. Bring the thread back to the bead. Wrap the d-rib back up to the bead of the hook, tie off, and trim the off the excess d-rib. Take a small amount of rabbit dubbing and apply it to the thread to form a small dubbing noodle. Wrap this behind the bead to form a small thorax. Tie in the partridge feather. 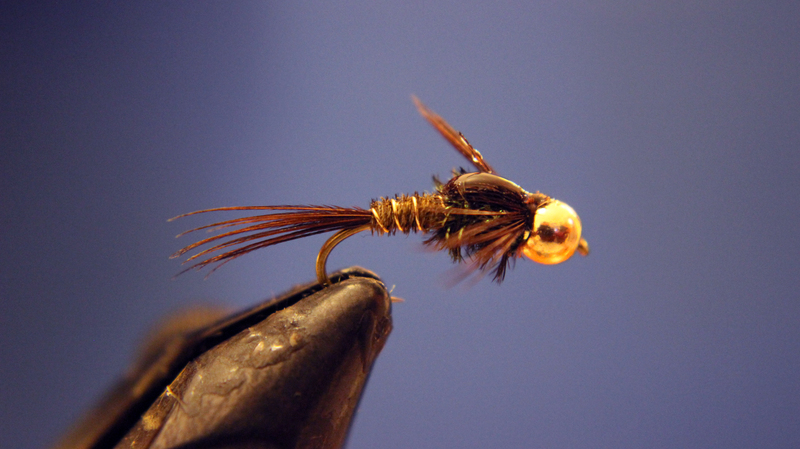 Take several wraps with the partridge feather to form the soft hackle. Whip finish and cut off excess thread. 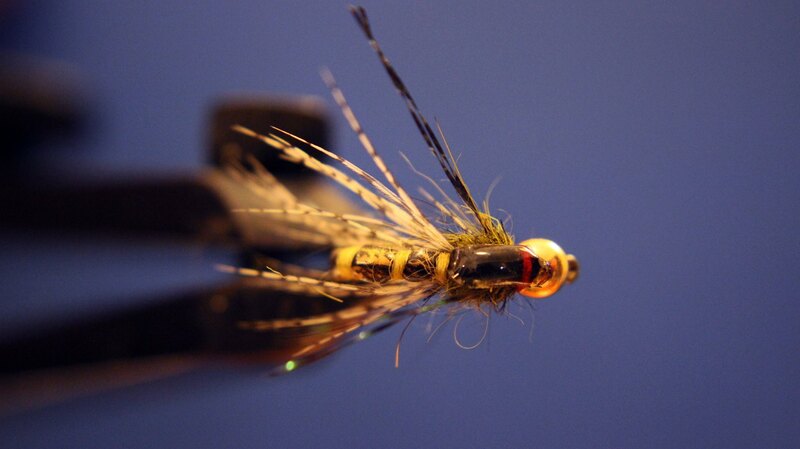 Wrap the thread to the end of hook then taking a small amount of pheasant tail tie in the tail of the fly. Take a couple wraps up to were you will form the thorax of the fly and tie in the wire and the holo tinsel. Cut off 3-4 turkey quills and tie them in at the tail of the hook. Take your thread to bead of the hook. Using a hackle plier take the turkey quills up to the bead of the hook and secure them in with your thread. 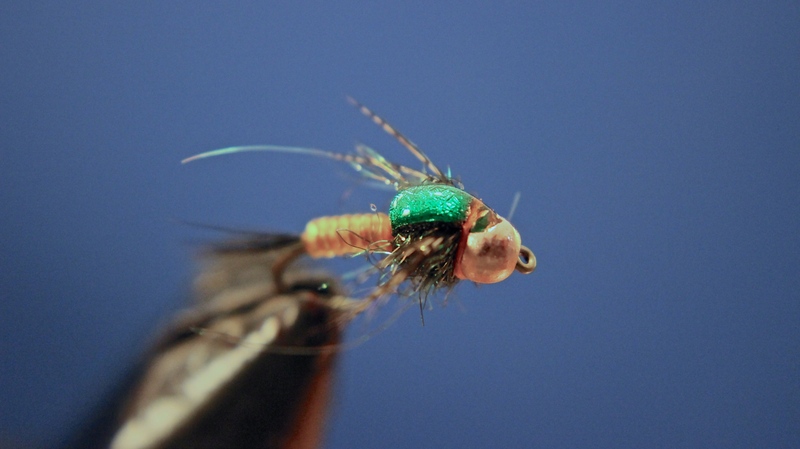 Pull your holo tinsel up and over the fly to the bead of the fly then secure. Candy cane the wire up to bead of the hook and secure the wire with your thread. Take the Awesome ‘Possum and apply to the thread to make a loose dubbing noodle. Wrap this dubbing noodle several times behind the bead then whip finish. 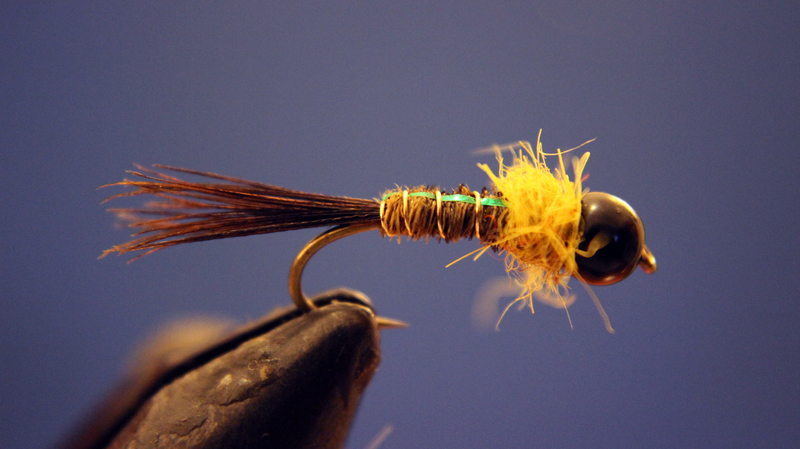 Take your thread towards the bend of the hook and tie in a small amount of pheasant tail to form your tail. 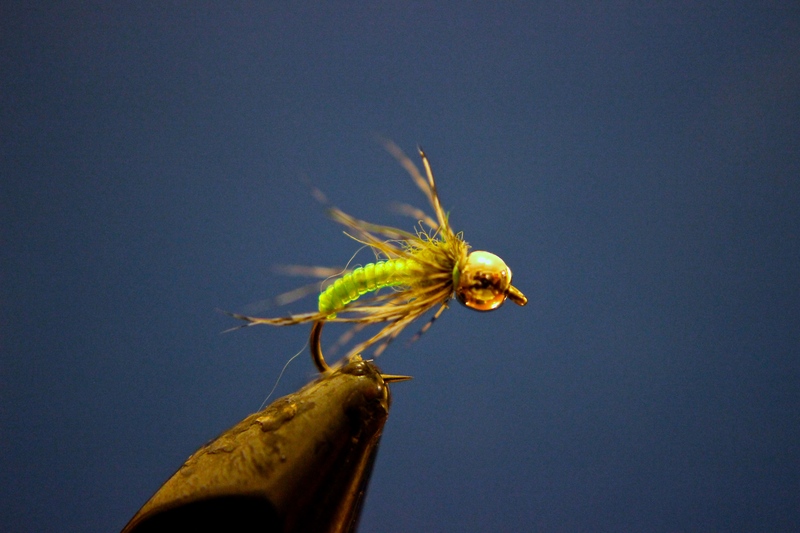 Take your thread back towards the middle of the fly and tie in your wire, take wraps towards the tail of the fly. Cut out 3-4 mottled turkey quills and tie in at the tail of the fly, with hackle pliers these quills up the fly to where you tied in the wire to form your abdomen. Candy cane your wire next in the opposite directions that you took your quills and tie where you stop with the turkey quills. Take your thread all the way up to the bead of the hook. Cut off 10-15 pheasant tail fibers, with the tips of the fibers facing towards the bead tie in fibers on top of the hook leaving just enough of the tips to form the legs of the fly. 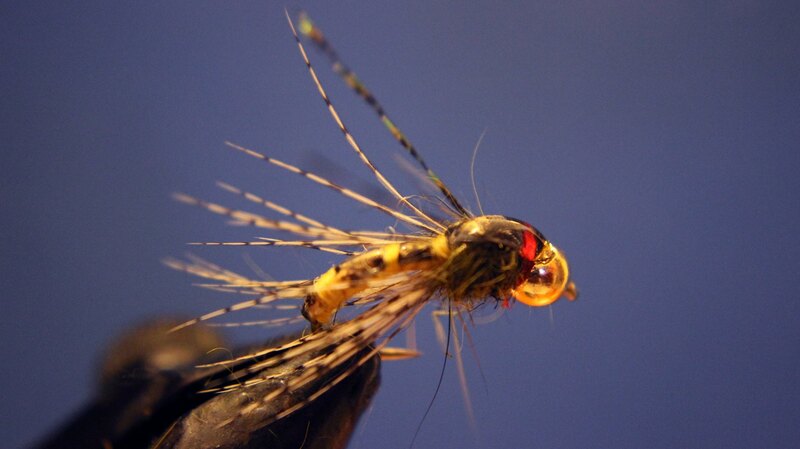 Once the pheasant tail fibers are secure behind bead wrap your thread back towards the abdomen of the fly making sure the fibers stay on top of your hook. From here tie in 4-5 peacock herls then take your thread towards the bead of the hook. With the peacock herls secure wrap these towards the bead leaving a small amount of room in between them and the bead. Take the pheasant tail fibers and fold them up and over peacock herls, dividing the pheasant legs when you get to the bead. Secure the wing case with several turns of thread and whip finish. With wet fingers pull the legs of the fly down and apply a small amount of CCG Hydro to the wing case and zap with UV light. Start by putting your bead on your hook and put in the vice. Secure your thread on the hook and take wraps to the below the bend of your hook. Tie in the thin skin. Take the yarn and cut off a six inch piece. Separate the strands of the yarn so that you have 4 1/4 strands of the yarn. Take one of these strands and tie on to the hook just above the thin skin (hint wet the yarn tip). Form a small cigar shaped abdomen at the bend of the hook with your thread, then bring the thread back to the bead of the hook. The next part is the hardest part on this fly, take your time and have patience. If you don’t like the way fly is coming together start over. So take the yarn with hackle pliers and spin it until its manageable again. Take this yarn and wrap it once around the hook, then bring over the thin skin, wrap your yarn over the thin skin, then wrap the yarn twice around the hook. Continue this process until reach the end of your cigar shape abdomen. Secure both the thin skin and the yarn, cut off the excess yarn but not the excess thin skin. Attach a partridge feather just above the thin skin, take several wraps with the partridge to form the soft hackle of the nymph. Secure and trim off any excess. Apply the rabbit dubbing to thread to form a dubbing noodle. Wrap the dubbing noodle up to the bead and tie off using the the red thread. Take the krystal flash and tie it in in this space behind the bead to form the horns of the fly. 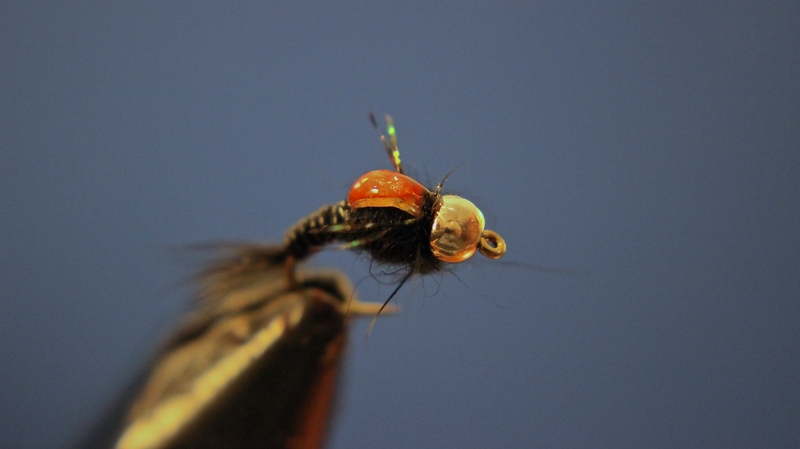 Pull the thin skin up and over the thorax of the fly, you will be going in between the soft hackle, then secure with tight wraps behind the bead. Whip finish and trim off the waste thread and thin skin. Cut the krystal flash horns to desired length. Pull down on the krystal flash and the soft hackle, put a small amount of CCG on the thin skin at the thorax, finish with UV light.